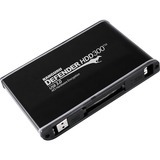 The Defender HDD300 is the world's most advanced, secure, hardware encrypted USB hard drive. It is a FIPS 140-2 Certified USB hard drive designed to meet and exceed rigorous government, healthcare and financial industry data security regulations, and protect even the most sensitive data. With FIPS 140-2 Certification, AES 256-Bit hardware encryption (XTS Mode), remote management, on-board anti-virus and super fast USB 3.0, the Defender HDD300 is perfect for organizations looking to secure information quickly and easily. The USB data storage drive is easy to use, tamper-proof, and has the option of being securely managed remotely by the organization if so desired for added security, along with other secure USB drives anywhere in the world.